Spammers do not care whether you want to receive their email or not. Despite the fact that there are laws to protect individual’s online privacy, but these spammers care the least. They might have secured an email list, which unfortunately has your email list and they just keep spamming it. GMail does a good job of blocking them, but many of them do slip by because they’re paying a bit more attention. 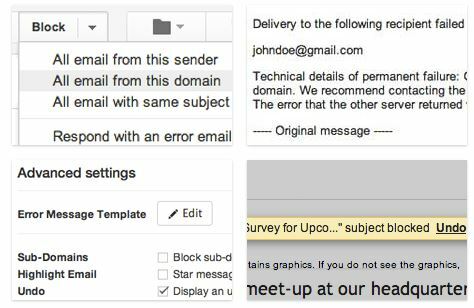 There is a way to trick such spammers – BlockSender is a Chrome Extension for Gmail that can trick the sender into thinking your email address is incorrect. Many spammers won’t care to see the “bounced” email notification, but this tool will be helpful to spam their inbox in return. When they get the bounced message from BlockSender, they’ll think they have the wrong email address for you. Hopefully after that, they’ll delete your email id from this mass email group and give you well deserved relief. . Try out the free version before you decide to invest further and also, let us know your feedback.